The first thing we have to do is to enable proper widget in Sonar. To do it just click on the dashboard's "Configure widgets", select "Integration tests coverage" item and place it in the appropriate position. 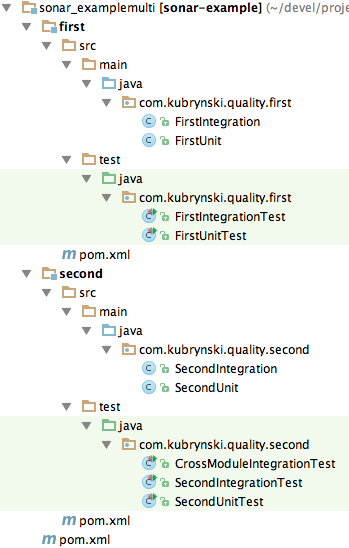 In TestNG we can combine tests in groups by using @Test(group="groupName"), and we're going to use this functionality and use "unit" group for all unit tests and "int" group for integration ones. Now a little bit more complex situation with configuring failsafe plugin. Failsafe is more suitable for integration tests because when a test fails, it does not immediately abort (instead it lets the clean-up by processing post-integration-test phase). I hope everything went ok, and now you can admire well measured code coverage on your Sonar dashboard! Unfortunately, this won't work if your itests are only on the Second module: itests will not cover crawled classes from the first one. Is there a way to run automated tests along with manual tests and then get the combined coverage? @Thejasvini - We've done something like this by adding Jacoco agent on a test environment. We haven't merged that results but I'm sure Sonar will handle it.